…what my Kindergarten artists will think, do, and feel when we work on this art process and product. their big beautiful brains will be filled with ideas and wonder. they will jump in with confident hope. they will experience the joy and excitement I feel when I create art. they will know they are artists who can make decisions about their art. These are my practice, and inspiration pieces. After making the first piece, I tried another using the new stamp pads I bought for my Kindergarten artists. As I prepped the page, I wondered what it would look like if I added a piece of tape down the middle. I like it, and am adding it as an option for my Kindergarten artists. The boarders are created using frog tape. It creates a nice sharp edge, and even more importantly, can be removed without harming the paper. The circles are stamps created from some tubes one of the students brought in. I cut them on our bandsaw so I’d have enough to give each artist a small stamper and a large stamper. Circles are colored with crayons. The background is filled with watercolor. Consider overlapping the circles and letting the circles extend beyond the boarder. Practice stamping on a scrap paper so you feel comfortable working on your piece. What colors will I make the circles? What color will I make the background? Will my background be one color, or many? Do I want a piece of tape to intersect my paper – creating two pieces? To show the artists that unexpected things (tubes from shoes, painters tape) can be used to create art. 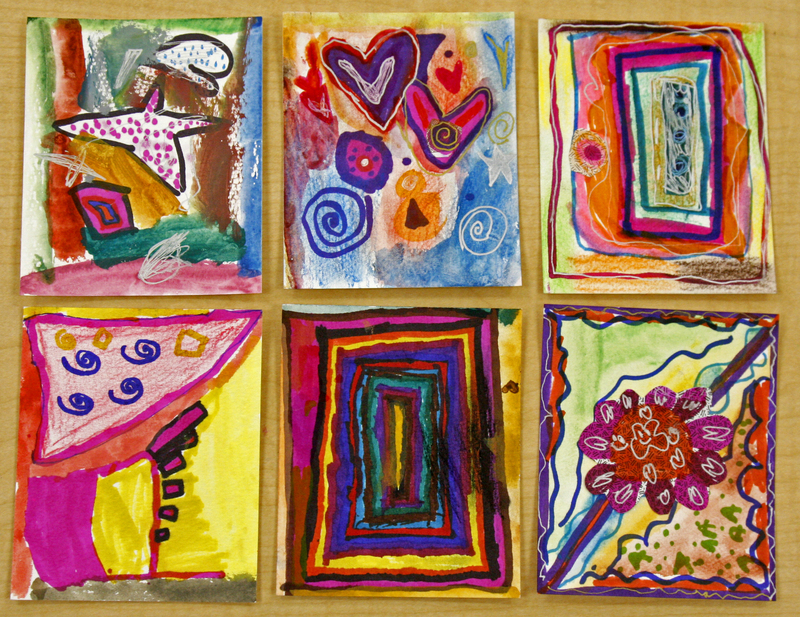 To expose them to the idea of combining various mediums into one project. To encourage them to think. To empower them to make decisions about their art. To explain the rules … and the options. To enjoy my artists, their process, and their products. To document their process and work. To be open to their interpretation of the process. To be willing to allow them to modify the process … depending on their interpretation, desires, and/or needs. All my jobs are important, but those last two, they are paramount. If I want my students to know they are artists, and to actually BE artists, I need to give them the freedom and respect artists need, crave, and deserve. If I want them to learn to make decisions, problem solve, wonder, and create, I have to give them the space, empowerment, and opportunity to actually DO IT! Sometimes we have to show a little courage in order to encourage it in our students! I pulled out two canvases. They were beautiful! Big, thick, pristine, white canvases. I was excited to make some sort of creative, statement piece. Something that was fabulous artistically and aesthetically, and actually said something about math. You may recall, I’m sometimes a bit of a chicken when it comes to the big, blank, white page! And, let me remind you, this was not a only big, blank and white, it was a canvas, and not a cheap one at that. But I had no time for timidity! I had two days to create two canvases. Eeek! 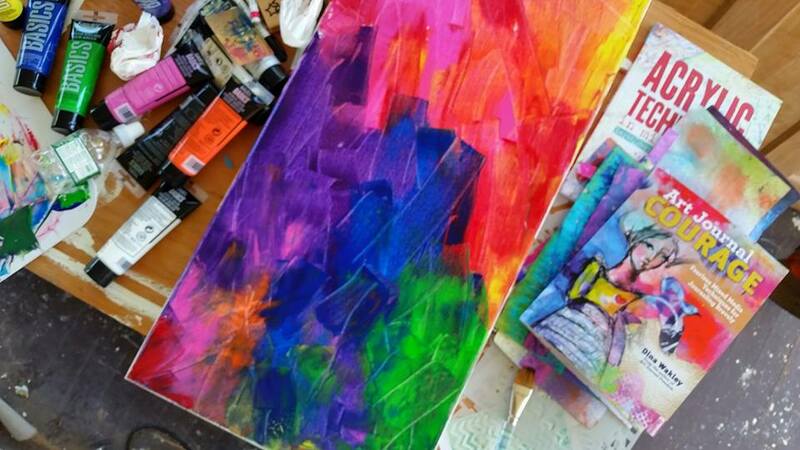 I flipped through a couple mixed media art books, and came upon many ideas I thought I could use – putting paint on the canvas with an old credit or gift card, creating layers with stencils and cut paper – and perhaps most importantly, not being afraid of the process. A deadline is not always helpful when you are being creative, but this time, it was incredibly helpful. I didn’t have time to entertain my fear of the blank page, or the possibility of destroying the canvas. I had to trust the process, the colors and me, and just do it! So I did. It was super fun and super freeing. 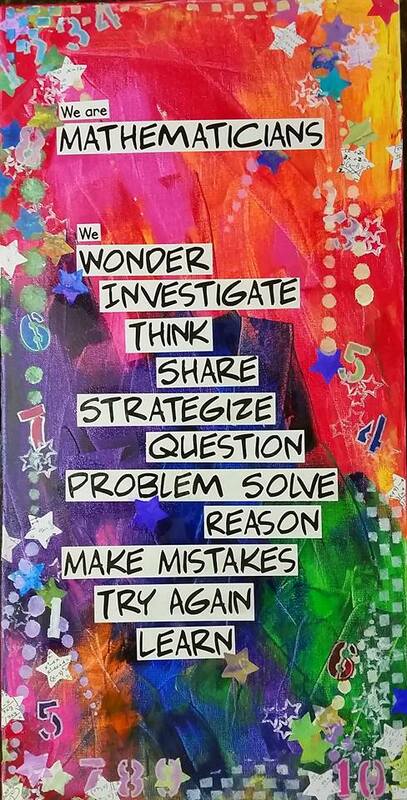 Hopefully it will inspire parents and students to wonder, investigate, think, share, strategize, question, problem solve, reason, make mistakes, try again and learn … even if they are feeling a bit trepidatious! Gustav Klimt is a favorite artist of mine. I enjoy finding ways to share his work with my students. Take a look at this work of his. It is beautiful! Clearly it’s a masterpiece, and yet in many ways it is a work accessible to my kindergarten students. It is a combination of shapes – both in the detail and the figures. I always have the girls work on a mixed media project when we are inspired by Klimt. I find it helps them express the detail he expresses when they have many mediums with which to work. Plus, it allows them to explore various mediums at the same time. Typically, I bring in some of my art materials to share with them. They love the chance to use “real art mediums and tools” and treat all my things with the utmost respect. I love that my sharing expresses my respect for them as people and artists, and, hopefully, encourages them to be generous with the things they value. This year I introduced them to Klimt while we were exploring shapes in math. I showed them full pieces, but spent most of the time drawing their eyes to the details and shapes found throughout his work. The girls enjoyed finding spirals, circles, squares, triangles, diamonds, rectangles and the many combinations of shapes Klimt created. I decided to have the girls work on a trio of small art-pieces instead of one large piece. I hoped it might help them be more able to fill the paper with shapes. While I love having them work on large canvases, sometimes the size overwhelms them. We worked on 3×5 inch pieces of multi-media paper. When the girls were finished I mounted their work on a black background to create a triptych. It was fabulous to sit and work with them. We shared pencils, artist markers, sharpie markers, a travel water color set, gel pens, crayons, pastels and security envelopes (fabulous idea I learned from Dar Hosta and Deb Barends). “Oooh, I like that!” “Can I try that?” “How did you do that?” “Oh I never thought of that!” flowed across the tables as we admired each other’s work, and were inspired to give the new ideas a try. While they sometimes need a reminder, they are learning to see “copying” their ideas as a compliment rather than a transgression. I encourage those who “copy” to truly be inspired, and to make subtle, or large, changes in order to make the work their own. I was, as always, impressed by their process and product. They have great, big, beautiful hearts and often it seems that beauty just flows out onto the paper. We learn from each other to be free with our work, loving the process and each other. While I was working on a piece, one of the girls asked if I would like her to help me. “Sure!” I said, although I wasn’t sure what might be created. Her additions to the piece were wonderful, and made the piece much more beautiful than if I had done it alone! 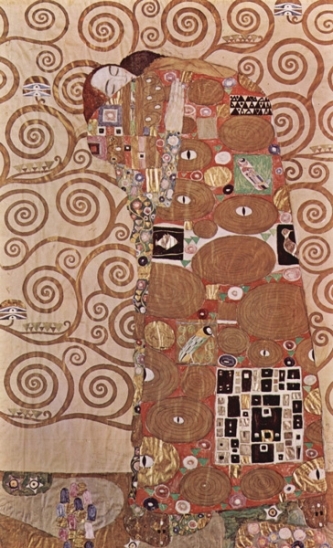 I’m not sure anyone would realize we were inspired by Klimt, but we were, and we too created beautiful works of art. Here are a few from six of my students. Enjoy and be inspired!